So, who here has animals? Who has kids? Who has husbands? Just kidding on the husband comment (kinda). If you have carpet in your house, most of the time, I’m sure it could use a bit of a pick me up in the freshness category. I was searching for our natural carpet deodorizer the other night and when I finally found it, I saw it was completely empty. So, in typical oily fashion, I started concocting my own recipe. I knew purification was a must because of how well it zaps air odors that animals leave, but I also wanted to add lemon to give it that ‘freshly cleaned’ smell. It turned out smelling wonderful!! And bonus: by sucking up the combo on the floor, it also deodorizes the sweeper filter! Disclaimer: I’m not a DIY’er by any means, but this was SO simple, that even I was able to pull it off! 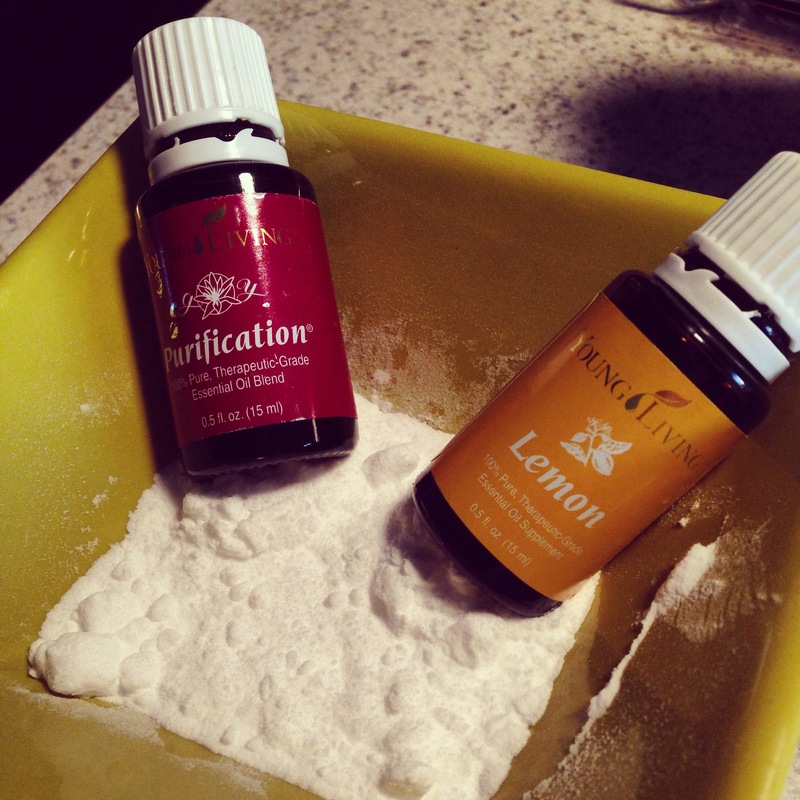 Combine the baking soda and both oils, slowly stirring the oils into the baking soda. Once the oils are completely stirred in (& clumps are gone), it’s ready! You can store it in any glass container with a lid, after use. Favorite Fall Scents–the Natural Way! It’s finally fall. Mixed feelings, as you know (refer HERE and HERE). Living in Indiana, you get to experience all four seasons. I’m more of a three season type of girl myself. Maybe one day I will live in a state that only experiences three seasons. Even though I DREAD what comes after fall, I do think fall is gorgeous here and there are so many great things about the season that I like! I know everyone is thinking “OK, smells, Mary?” But, hear me out! A lot of memories can be brought on from a scent. When you smell fresh air and cut grass, you think of summer. When I smell warm spicy smells and citrus together, I think of fall. I used to be the girl running to Bath and Body Works when the fall candles came out. I would also stock up on their fall scented wall plug-ins. Last year, after getting started with essential oils, I decided I was no longer going to be the candle/wall plug-in girl. There are so many carcinogens in those manufactured products, and I’m assuming the better the plug-in smells, the more junk it contains. I didn’t want our kids to be breathing the chemicals all the time, not to mention the plug-ins are major fire hazard! I guess I could learn how to make my own scented candles, but that sounds like it would take a lot more time than I have right now. 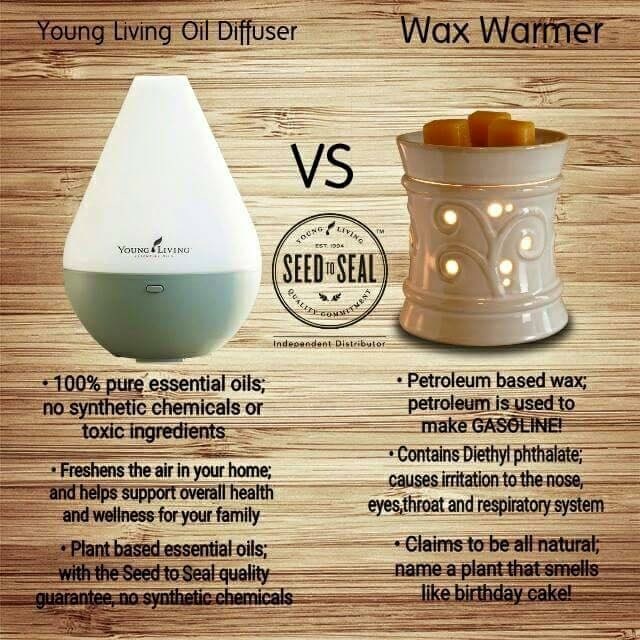 Now I use our home diffuser from Young Living (part of the premium starter kit) and a variety of 100% pure essential oils from Young Living. I can mix-and-match to make the perfect fall scents and the best thing is that I can breathe easy (pun intended) knowing it is not hurting my family’s lungs, or putting our house in danger while we are gone for long periods of time. 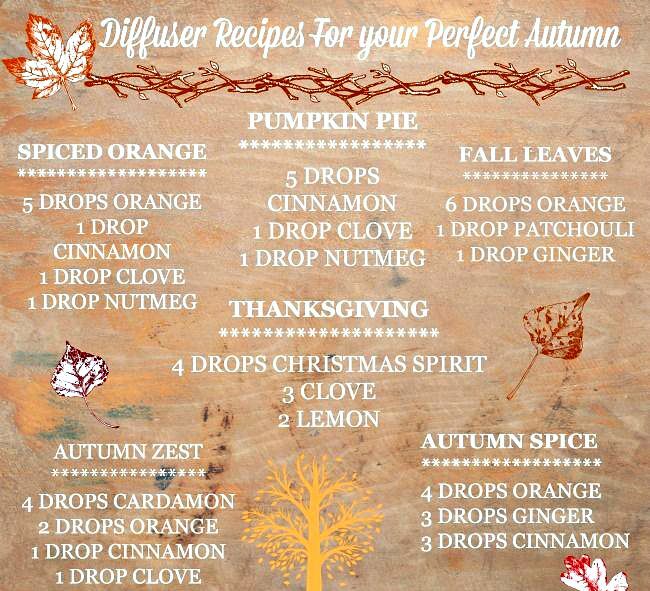 With just one home diffuser, we can safely enjoy fall scents throughout the entire first floor of our home! We have a really open entry way that opens up to a huge loft when you walk up the stairs, so if I have the diffuser going in the kitchen, I can even smell whatever is diffusing upstairs in the loft area as well. An added bonus, when you are diffusing oils, you will also receive the therapeutic benefit as well. 2 birds. 1 stone. I can’t control a lot of things in life, but this is something I actually can control. To me, it’s the best of several worlds…it’s completely natural, it is therapeutic and if our 2 year old gets into it and spills it, it’s a cool mist (similar to a humidifier) and won’t hurt him like candle wax would. Let me know if you try any of these combos, and what you thought. Hello friends out there in blog world! Healthy living and weight loss are subjects I hold near and dear to my heart. I’m pretty sure most of you are aware of this. THIS POST from last year still stands and I’ve kept the weight off. This is not the “I’ve fallen off the wagon and even though I told you I would keep it off, I’ve gained it all back and fell into bad habits again.” Follow up post—TRUST ME. This is quite the opposite actually! Have you ever wanted to be the absolute BEST version of yourself? Have you ever wandered “how much could I lose, how much could I tone, what would I actually look like if I was at my optimal weight and had the best body image?” I think about this daily—probably too much. But, like everyone else embarking on a weight loss/healthy lifestyle journey, my struggle is being consistent and disciplined with portion sizes. I always say if they sold discipline and consistency at the store, I would pay whatever price they wanted. Yes friends, the struggle is real. So, while in the shower one day (where I do my very best thinking), I thought “why not make my blog followers keep me held accountable? Why not leave anything to the imagination, so that if I screw up…I have to document it, just like I would document a good choice.” This will obviously take a lot of work on my end, because it will require documenting food choices, work out choices and small details like water intake, calorie intake, fun outdoor activities etc. And, everything is a time struggle for me because I work full time and my husband and I have 2 little boys. BUT, I will also be documenting working around that as well…or better yet, including them in healthy activities. Nothing is more inspiring to me than any kind of drastic transformation, and I love the idea of working in a group to achieve goals, which is where my lovely followers come in. You can cheer me on, or virtually slap me on the hand for going over calories for the day, or for not getting in 8 glasses of water a day. It helps me to know that others are watching me…..paying attention and caring enough to call me out! My plan is to document weekly on my blog and daily on Instagram and my ModMommyMK facebook page. Even if I do not end up having anyone follow the updates or join me, if I stick with it, I will be able to finally know what the best me looks like and feels like. And if I inspire someone else….well, then my job here is done, because that would mean more than anything! Life is too short to sit back and watch others achieve their dreams and goals. No one is going to make this happen for me, EXCEPT ME. So, here we go! I would love for you to comment on my updates, IG posts or FB posts. I would also love to hear your suggestions regarding recipes for snacks, dinners and lunches and favorite work outs. Starting size: a loose fitting 6, some 4’s. Let the challenge begin!!!! If anyone would like to join me–please let me know!! !